I know I haven’t posted anything about dining out lately so here goes … here’s an illustration of a well-balanced meal. Seriously. I think, if I were somehow tortured and absolutely forced to eat the same thing every single day, I would probably go with this. What is “this”? This is what I had at Yoki a couple of weeks ago. I know you’ve heard me tell you how much we love Yoki before, so when I wanted some delicious sushi it wasn’t too difficult to decide to on where to go. This time I had their Midori maki roll which I think is going to be my new standard order. It’s made with yellowtail, tuna, and salmon and topped with wasabi tobiko and scallions. What I love about it is that it combines my three favorite fishes, the spiciness and crunchiness of the wasabi tobiko, and that it doesn’t have vegetables that I’m allergic to like avocado and carrots inside it. Pure yumminess! Oh and my usual negihama maki roll (yellowtail) on the side. And to accompany it? An order of their beef tataki appetizer. I know it’s just sliced rare beef but it’s so good. And yes, that’s a glass of red wine you see next to my plate. It’s a nice glass of Cline zinfandel. I’m one of those people who believes you should have whatever wine you are in the mood for with your food, and who cares if you’re having fish. If it all tastes good together, that’s what’s most important. Well-balanced? You got your protein = beef. You got your grain = rice. You got your fish = lots of it. You got your fruit = wine. Looks well-balanced to me! 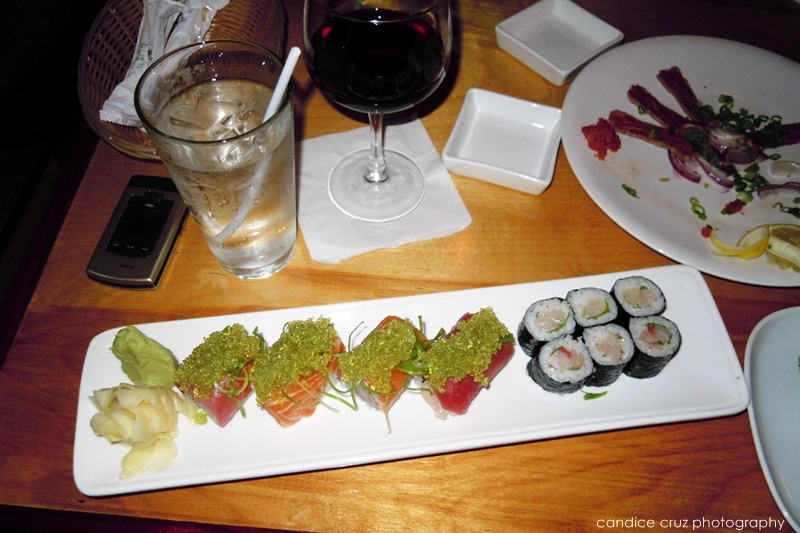 This entry was posted in beef tataki, food, sushi, wine, Yoki by shortcakescraps. Bookmark the permalink.